June 8, 2015 / Heidi B. It was in 1994, after I finished reading Outlander for the first time, that I couldn’t help but think what a great television miniseries it would make. As I continued to read the book series, the world of Jamie and Claire came further to life in my mind. I was there. I could see the scenes clearly, imagine the sights and smells. I felt their happiness, celebrated their triumphs, mourned their losses. They were as real to me as any book characters could be. Throughout the years, the Outlander book series was my companion. Through life changes, moves, and heartache….they kept me company. They were a constant and gave me hope when life seemed to drag me down. As with many things, Outlander took a backseat (or back shelf, as the case may be), as I pursued other interests and fulfilled my responsibilities. In 2010, after living abroad for several years, I moved back to my hometown. There in a box in my parent’s garage were my beloved books. I immediately re-read Outlander and found myself once again reunited with my old friends, Jamie and Claire. As if I’d never left. After I finished reading, I was curious if they’d ever been made into a series or movie, so I grabbed my laptop and Googled away. I was ecstatic to find mention online that there was a renewed interest in producing a series based on the books. In late 2012, rumors were circulating online about Sony/Starz buying the rights and bringing Outlander to TV. Like so many fans, I monitored forums and websites, anxious for information. When it was confirmed, the search began for actors to play the lead roles. It was an exciting time. Finally, fans around the world would see the world of Jamie and Claire brought to life. The initial excitement of casting announcements in summer of 2013, was slightly overshadowed by the reaction of some very critical book fans. Here fans were, about to get a gift, a television series based on books we loved for 22 years, and they couldn’t get past hair or eye color. Luckily, I found a newly formed group on Facebook that was equally as thrilled as I was, Heughan’s Heughligans. Now, as the group as grown to over 13k members, I’m glad to have found my niche as both a member and admin. We remind each other (and new members) daily, how lucky we are to have both the books and the TV series. They compliment each other. Whereas the books have given us the flesh and bones of the story, the series has visually brought the essence of Outlander to life. I can easily imagine the Scottish highlands, but seeing it before us…a canvas on which the actors paint Diana Gabaldon’s exceptional words, has been breathtaking. Each of these mediums can stand alone easily, but are better when enjoyed together. The gift of Outlander, both book and TV series, is one we should never take for granted. Is the TV series perfect? No. Should it be a word for word reenactment of the book, or a medium by which the books are expanded and enhanced upon? Whatever your opinion, I think we can all agree that when given a gift, it’s never polite to insult the giver or the way it’s wrapped. So, thank you to the cast and crew of Outlander, who work hard to give us the beautiful gift of our favorite book brought to life. Thank you to Diana Gabaldon for giving them great material to work with; and to Ron D. Moore for showing us how the story can be enhanced in ways we hadn’t thought of. Je suis prest for season 2…Dragonfly in Amber! I have joined, looking forward to finding out what the club is all about. I am currently in 2 book clubs where I live. Thanks for reading! You should join our Heughligans book club. There’s a link in my newest blog post. Thank you! Loved the tribute to Diana. Now I don’t feel so foolish for my obsession with Outlander! I can identify with more than a few of the comments. I started rereading the series, too. This article is simple and beautiful. The TV show IS an artistic gift, a re-telling of the story using a visual medium. If you have a respected painter paint your favourite image and it captures the emotion for you every time you look at it, then it has done its job. It’s not an exact replica – if it were you would just take a photo. I have a pretty good imagination (as a screenwriter) but I have to say that the visual imagery – whether it’s the lushness of Scotland, dampness and curl of hair, or the subtle eye movements or hand twitches by Jamie and Claire- adds a whole new dimension to Diana’s amazing core story. Re-reading the books, I now have flashbacks to the new on-screen imagery. And it has added a heightened intensity. It is a gift. A gift that keeps on giving. I too am a long time fan. For 20 years I had the hope that this wonderful story would be made for TV or movies. I remember a couple of times when Diana announced she had sold the rights to her books. She warned the readers that we might not be happy with the results. The option deadlines passed and nothing happened. When she announced she had sold the rights again and there was an actual producer, I was hopeful again. It seemed promising because it was Ron Moore. As time got closer to actual production, I remembered Diana saying that she read the first scripts and she was so happy that the writing didn’t make her want to burst into flames. I took that to mean that the other scripts must have been pretty bad. Having been through this long vigil, I was so grateful and excited. I mention all this because I was in a conversation with people who have been very critical of the series so far. I think there is a difference between long time fans and people new to the books and watching the series. There is a lack of history in the newer group, and a lack of understanding as to why Outlander fans have been given such extraordinary access to the production and cast. Therefore it seems to be taken for granted. As if somehow the process of creating the show is up for debate. I even had one of the people talk about the older fans like myself as if our support for the show was lame and naive. Honestly, they don’t have the history to know why we feel the way we do. Frankly, I am hurt and insulted by these attitudes and that was the last conversation I will participate in. I think the problem is that even if strong fans of the show have any questions about the scripts or the way things are being done without meaning to sound displeased with the whole project, others who are displeased and don’t care if their comments sabotage anything will join in and then it escalates. The point I’m trying to make is that those of us who support the show and all the efforts the cast and crew are making, need to let our voices be known, not in argument or opposition to the critics, just not sit back and let louder voices prevail. Sorry this is so long, but it’s been bothering me for a while. I just had to say something since what I was thinking was verified by the comments made to me. I am hoping that the swell of support overcomes the naysayers especially in the case of what happened with Terry and Ron. Your message is spot on. I love the books and I love the TV series. I really cannot understand why some people should use trivial things like hair colour, height or whatever they can griped about to bring the show down. The Tv series is fantastic and as you said, we have been very, very lucky with the casting….Sam Heughan has brought jaime to life for me and so has Caitriona Balfe as Claire.and the rest of the characters as well. I hope Starz would ignore these irrational complainers and observed how many people love the show as it is with its slight faults but more perfect fantastic adaptions . I want this show to continue to its last book and for that , the fans must stick together and drown the protesters with our positive comments. The books shall forever be mine. There’s an “Outlander” book land with my own vision of the characters (I still can see my version of Book Jamie that is not Sam), of Scotland and Paris and other places (no spoilers here) that can only be mine and mine alone. Then there is the Outlander TV Series. A separate “Outlander” land with wonderful people I didn’t meet in the books (Lt. Sweetie, Willie, the 18th Century Laurel and Hardy, and wonderful stories that are new to me). I love them both and wouldn’t have it any other way! Well said!!!! Bravo!!! I couldn’t have said it better myself other than to just add that Sam is the PERFECT Jamie and Caitriona is the PERFECT Claire! 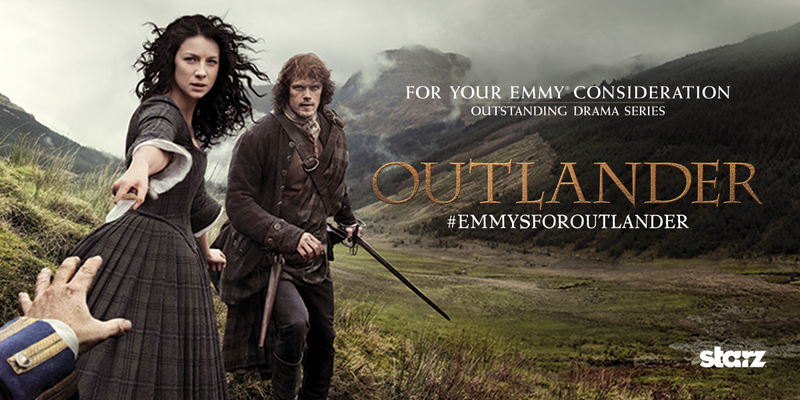 Thank you to everyone that makes Outlander happen !!!!! And to Heughan’s Heughligans! Love you guys!!!! Thank you for saying what many of us are thinking; you seem to have quite the knack for doing so!! I also wanted to add that Outlander World is even better because of the show. I just finished DIA (spoiler alert) and cried while reading the scene with Rupert and Dougal at Falkirk. I didn’t shed a tear the other 4 times I read it. I have come to really care about Rupert, Willie and even Angus. So we shall see how other characters develop for DIA. Thanks again for all you do! Thank you for this, Hope – a well-written reminder for us to be thankful for what we have, which is a fabulous book series, plus a lovely fleshing out of the first book & the beloved characters who have become so real to us on Diana’s pages.